A sofa is one of the most important elements when it comes to decorating a house. It acts both as furniture set as well as a statement piece. Sofas are also the most expensive fixture that one invests in any home and can either make or break the atmosphere of a room. Furniture has come a long way from the traditional foam-based sofas to more refined leather and fabric sofa sets. Modern sofas are designed to create a flawless ambience, regardless of your style preference and budget limit. The 21st-century homeowner is constantly on the lookout for contemporary and minimalistic furniture styles. A growing number of people are now moving towards open spaces and smooth forms when it comes to setting up their urban homes. Leather furniture has always been in vogue and sofas made of leather are considered to be timeless. Leather is known for its sophisticated and suave look as well as feel and can immediately uplift the vibes of any room. Most modern homes have at least one brightly coloured wall which can be perfectly balanced with a fashionable beige leather sofa. Like wine, leather too becomes better with age. If you want to add that ‘oomph’ factor without compromising on elegance, look no farther than leather. Sofas are regarded as the most used piece of furniture in any home. After a long day of work, sometimes all you want to do is stretch your legs in the comfort of your sofa set. 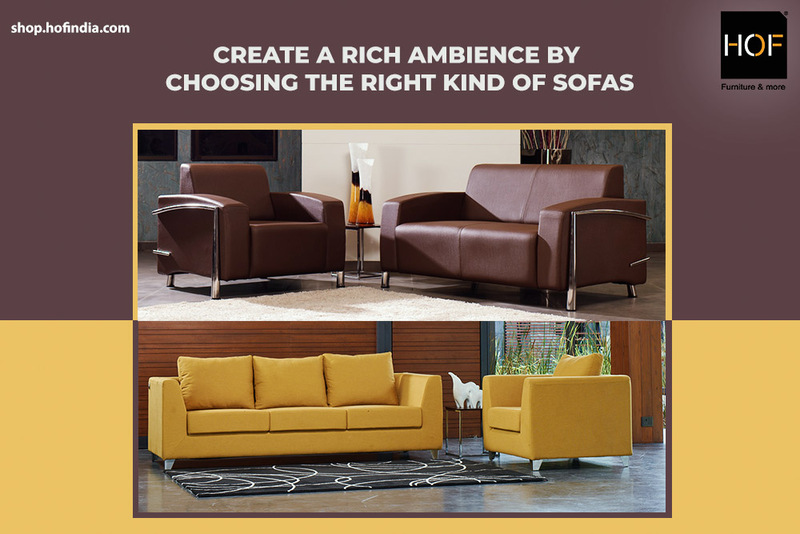 Sofas are similar to fashion in the sense that, comfort must come before trends. Since a lot of time is spent on your sofa, it is only natural to wish for a piece that scores high on durability. Fabric sofas add texture and warmth to your room setting. They come in a range of colours and can immediately create an inviting atmosphere. The main advantage of sofas made of fabric is that it is very easy to find a fixture that can complement your curtains, carpets and cushions. If you want a cushy couch without compromising on stability and comfort, feel free to go with the fabric way. At HOF, we understand the essential role played by sofas in urban homes. Our range of sofa sets is designed with the best material to provide your room with class as well as comfort. Take a look at our range of sofas at shop.hofindia.com TODAY!